popular because of her songs in films and possessed an unforgettable voice in the local music field. She was born in Pallimulla, Matara and was the seventh in a family of 10. Angeline who was brought up according to Roman Catholicism ... hymns were not something unfamiliar. Angeline who loved hymns in the church, with the aid of her elder sister who served Ceylon Broadcasting Corporation was able tp present herself at a singing competition and having been placed second ultimately turned out to be her stepping stone. Subsequently, Mr. Siri Sathkumara who was a well known artiste at that time paved the way for her to enter the 'Lama Pitiya' of radio ceylon. It was there that she had met Karunarathna Abeysekera who laid the foundation to her life. When she sang songs for the film 'Sohoyuro' she was but 13 years of age. The songs she sang for the films 'Deiyange rate', 'Daskam'. 'Gehenu geta' became hits. The Jothi - Angeline era dawned in the 60 - 70 period. Later on she used to sing with Milton, Gratien. 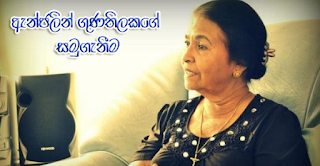 Angeline who was married to Lesley Mahinda Gunatillaka is the mother of two daughters. The eldest daughter Milani is living in New Zealand while the other daughter Dilhani is in Sri Lanka. Though the daughters are not connected to singing, it was reported recently that the nephew showing a tendency in that line has made her happy. Angeline has her final years expressed disgust and sorrow to newspapers over her ideas about the culture of robbing songs of celebrities. Her contemporary friend Latha Walpola spoke emotionally about unrecognised hopes of Angeline Gunatillaka in relation to her demise. "When she was sick, I went to see her. She embraced me with emotion. From that day onwards I kept on visiting her. What she often said was, 'Let's get better and do a show together. But that never saw the light of day. I am sorry about her departure".